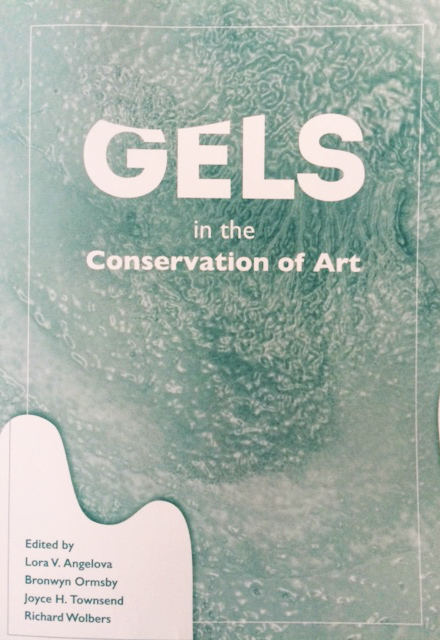 A pioneering international conference on the use of gels in conservation was held in London last month. Its aim was to give a snapshot of current theory, research and practice on the use of gels for treatment processes in the conservation of art objects and decorative surfaces. The range of gels featured included those drawn from the biological, cosmetic and food industries, as well as products created specifically for conservation purposes. The event was organised by the Tate and International Academic Projects. It hosted speakers from the fields of conservation, conservation science and academics – from Europe and north America; notably the ‘father’ of the field, Richard Wolbers, of the University of Delaware Conservation Program/Winterthur Museum, who gave the keynote address, and Paolo Cremonesi, conservation chemist and leader in the use of agar gels in conservation. Gels are of particular interest in conservation due to their ability to offer highly controllable systems, with solvent or aqueous solutions delivered to the selected surface in a precise manner, which minimizes diffusion and possible side effects, and allows treatment at molecular level. As well as the controllability and precision of treatment, applying solutions in gel form dramatically reduces the quantity of solvent/solution necessary for a treatment – and, with the increasing advances in the use of aqueous-based solutions, can reduce the need for solvents altogether. This reduction in solvent based, toxic materials makes for significantly safer working conditions for the conservator, manages the risks to the art works/object undergoing treatment, and improves environmental impact – making it one of conservation’s contributions to environmental responsibility and the green movement. The controllability of gels in conservation treatment makes them potentially particularly useful for the conservation of vulnerable and/or unstable modern and contemporary materials. With this in view the European research project, Nanorestart has been developing nano material-based solutions, including gels for conservation – particularly aimed at the conservation of modern and contemporary materials. The Tate are directly participating in this research project. During the conference, there was the opportunity to visit the gallery to hear about their contribution to this project. My personal experience of gels has so far been limited to the use of agar gels for surface cleaning of polychromy. I found Paolo Cremonesi’s talk extremely interesting, particularly his suggestions of the different forms in which a simple agar gel could be used, tailored to the specific qualities of different surfaces and dirt types – with gels used in forms from cut shapes from preformed blocks that could be laid on flat surfaces, to preformed rigid gels grated into tiny particles which could be moved across a surface with a brush, to gels set into a cylinder shape in a syringe, which could then be worked across a surface like an eraser. IAP is uploading recordings of selected presentations to its website, currently, the video of Richard Wolbers’ excellent opening paper ‘Gels, Green Chemistry, Gurus and Guides’ and the first session questions and answers session can be found here: http://academicprojects.co.uk/gels-conference/gels-conference-presentations/. With luck, the Cremonesi talk will also soon be available on the site. Conservation of C16th Painted Panelling at Magdalen College, Oxford. © 2019 Bianca Madden. All rights reserved.